What are the peculiarities of migration from Squarespace? Q: Can I migrate Product Additional Info from Squarespace? A: Yes, Cart2Cart supports migrations of Product Additional Info from Squarespace. There are, however, a few peculiarities. From additional info section we migrate only basic content blocks like: Text, Markdown, Quote, Image, Video, Audio and Embed. 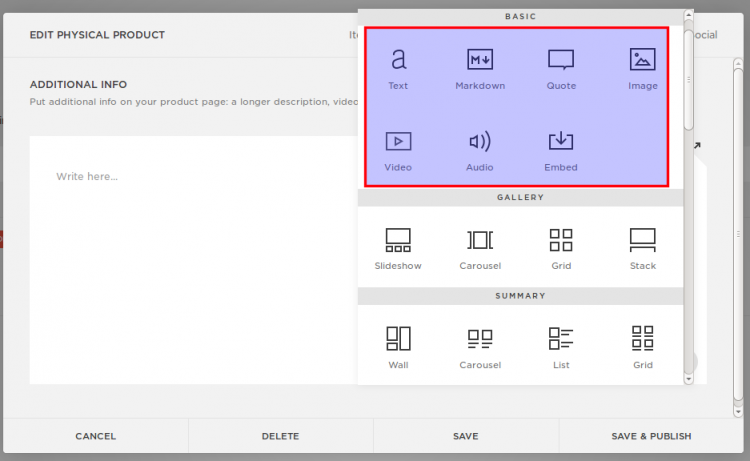 Other content blocks like Gallery, Summary, Chart, Social blocks, etc cannot be transferred in terms of Cart2Cart migration. Q: Can I migrate Downloadable Product from Squarespace? A: Currently Cart2Cart doesn’t support transfers of Downloadable products like music files, photos, eBooks, software etc. But information about Downloadable products (product name, description, price) can be moved to Simple product section on a Target store. Service type products can be migrated to a Target store as Virtual products if the platform supports such option.